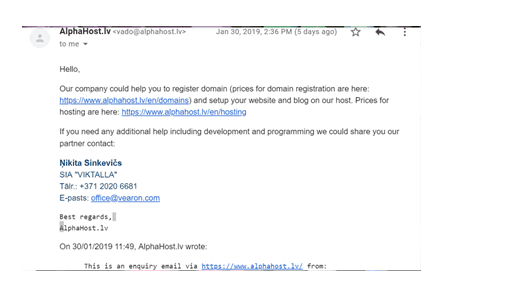 AlphaHost.lv Review 2019: Is AlphaHost.lv a Good Hosting? AlphaHost is a Latvian web hosting company with professionally certified experts committed to providing fast, secure and reliable hosting services. Latvian host AlphaHost has been providing its customers with quality hosting services since 2001. This company continues to provide VPS, dedicated servers, and domain-related services using servers located in Latvia, Turkey, Russia, Venezuela, and Lithuania. The AlphaHost website can be switched between the English, Russian, and Latvian languages. AlphaHost primarily provides managed cloud hosting, domains, VPS/VDS, and dedicated servers for both personal and business users. Its servers are optimized for Drupal, PrestaShop, WordPress and other CMS software. Hosting packages are powered by the popular and easy-to-use cPanel control panel for managing your hosting. And your data is backed up daily. The only notable downside is that the 99.9% uptime guarantee is a little low by industry standards. The entry-level Alpha plan starts you off with 3 GB disk space, one domain, unlimited traffic, 20 email accounts, one MySQL database, three FTP accounts, cPanel control panel, package installer, daily backups, PHP 5 and DNS management. AlphaHost’s other services include domain services, and VPS hosting that uses cutting-edge virtualization technology to fully guarantee resource allocations and prevent overselling. AlphaHost offers three shared hosting plans at very affordable prices, and the available billing cycles depend on the plan you pick. While the Alpha plan mandates a minimum one-year commitment, the Gamma plan allows you to pay monthly. In terms of sign-up incentives, there are deep discounts for longer-term commitments, and there is a 14-day free trial that lets you try the hosting (with full technical support) before you buy it. There are no setup fees. Although AlphaHost offers 24/7 technical customer support by telephone and email, my personal experience didn’t quite live up to my expectations. While the support staff sent a detailed response, it took them several days to do so. For a high-performance and affordable web hosting experience with multiple global server locations, AlphaHost is worth a look. The only real downside is the low uptime guarantee. Wondering how AlphaHost.lv stacks up against other Web Hosting companies? Enter any other Web Hosting company and we will give you a side-by-side comparison.